July 29 is National Lipstick Day! We’re always happy to highlight the fun in beauty, so to celebrate this day we’d like to share our best tips to prep your lips so they’re super-smooth and they look fantastic under lipstick—no matter how dark, matte or bold it may be! The worst thing that can happen with lipstick isn’t an unflattering color—it’s flaky lips. Unlike the skin on your face and body, your lips aren’t protected by layers upon layers of skin. There’s only one thin, transparent layer, which is why they’re relatively more pink (the blood vessels underneath show through more prominently). This delicate nature of your pout is what makes them so prone to dryness. With low humidity, winds and air (especially with indoor cooling/heating), they shrivel up. So what can you do about it? Try using a gentle micro-exfoliator that can get to even the tiniest of flakes. ILUMA intense brightening exfoliating powder harnesses coconut milk powder and pumpkin enzyme to help exfoliate the skin. Massage on your lips in small, circular motions and rinse with lukewarm water. If you’re short on time and need a solution STAT, simply mix raw brown sugar crystals with honey or coconut oil, then scrub on your lips. One caveat: do not overdo it! Think about your facial skin. If you exfoliate just the right amount, it glows. If you do it too much, it will get irritated. Your lips are even more sensitive, so take that into consideration. Always “listen” to what they say. It’s important to note that lip moisturizers aren’t meant to absorb into your skin like the face creams; instead, you want a lip product that also forms a barrier against external dryness triggers, while keeping moisture locked inside. 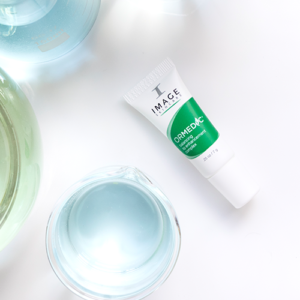 Our ORMEDIC balancing lip enhancement complex instantly infuses lips with soothing hydration with fatty-acid-rich avocado oil while creating a glossy barrier to prevent water evaporation. On top of that, the ORMEDIC balancing lip enhancement complex is an excellent lip primer. Because it physically “fills in” the small crevices in lips and improves the appearance of lip contours, it helps lipstick glide on seamlessly. Aside from consistently exfoliating and moisturizing your lips, make sure you avoid fragrances and menthol, which are known to cause irritation and sensitivity. Finally, do NOT lick your lips! It might be habitual or seem like the right thing to do (after all, saliva is liquid so it seems moisturizing), but it contains enzymes that contribute to breaking down the components (fat and proteins) of your skin which cause even more dryness. Remember, saliva is meant to help you digest food—you don’t want that same mechanism occurring on your lips.